This page is aimed at representing non-operational tanks of the Wehrmacht in WW2, ranging from pre-production prototypes to more obscure paper projects. It is about bringing “what-if” operational camouflages and markings to forgotten models that were not chosen for production. What if Germany had resisted the onslaught long enough to unleash a whole array of these deadly machines, or had chosen to start building other more or less expensive tanks? Would have these vehicles really turned the tide, or would they have been massive failures, engineered by a megalomaniac brain obsessed with war-winning Wagnerian ideas of “grandeur”. Who say size doesn’t matter ? A battle raged on production matters between Adolf Hitler and Albert Speer. The Führer’s ideas of land battleships and other super-heavy tanks and high-tech armament were extremely expensive and often impractical; as opposed to the cold realism of Albert Speer. One of the few people that had the final word on Hitler’s fantasies, cancelling many of the projects that will be shown here. Probably the most outstanding of these projects were the Landkreuzer P.1000 Ratte and the P.1500 Monster. The former had the main armament of a battleship turret, while the latter was a gargantuan SPG fitted with the biggest piece of ordinance in the world at that time, the 80cm Schwerer Gustav, manufactured by Krupp. These projects were quickly canceled by Albert Speer, who recognized their ridiculousness; They would have indeed taken a terrible burden on steel supplies and other resources, not mentioning the expenses and skilled labor hours, all for dubious operational capabilities in the end, considering they would have been massive targets for Allied aircraft, and would have been too large to use any existing infrastructure. When the IS-2 started to appear on the battlefields of WW2 in late 1943, the new Red Army tank outperformed the best tanks at the German Army’s disposal, such as the Panther, Tiger, and Elefant. Germany’s response not only came with the King Tiger, but took also the shape of the 75 ton Jagdtiger. But the German engineers were not done yet, they wanted to go bigger. Next came the Panzer VII Löwe, or Lion, originally a 75 ton tank to be armed with a brand new, high velocity 10,5cm L/70 cannon. The original idea of the Löwe was to be a command tank for groups of Tiger IIs, but the design quickly swelled past 90 tons. There were at least six designs for the Löwe, there were probably more, but they have been lost to time. The later, heavier designs were armed with a 15cm KwK 44 L/38. At this point, the Löwe was dropped, and was replaced by the VK100.01 Mammut (Mammoth) as Germany’s fantasy super-tank. The VK100.01 quickly grew into Porsche’s Type 205A Mäuschen, or Little Mouse, and then, of course, the Panzer VIII Maus. At the point in the War where any sane person could see that Germany was going to lose, tank engineers were more concerned with standardizing the production of the Third Reich’s tanks for years to come. In the Entwicklung, or Standardpanzer Program, there were to be five tank classes, each representing a weight class and function. E 5: Light tank weighing between 5-10 tons; the E 5 was not originally included in the Standardpanzer Program, but was a proposed vehicle, called the Panzerjäger Rutscher, that was grafted into the Entwicklung family. It was crewed by two men, and would have been produced by Bussing, Daimler, Steyr and Weserhutte. Planned duties were scouting, flamethrower, fast infantry support, light APC, radio relay, or light tank destroyer, mounting dual 8cm PAW 600s. Only a wooden mockup was built. E 10: Light tank/tank destroyer weighing between 10-25 tons. The E 10 was to be built by Klockner-Humboldt-Deutz Magirus AG in Ulm in very large quantities. It was to replace the Panzer 38(t), Jagdpanzer 38(t) and the various Waffenträgers based on their chassis. One interesting feature of the E 10 is that it was to have “kneeling” suspension, that would have allowed it to minimize its profile while sacrificing mobility. Only a wooden mockup was built. E 25: Medium tank/tank destroyer weighing between 25-50 tons. Designed and produced by Alkett, Argus, Adler and Porsche, the E 25 was to replace the Panzer III, Panzer IV, Sturmgeschutz III, Jagdpanzer IV, as well as provide a medium scout vehicle. E 50: Medium tank weighing between 50-75 tons. Designed by Argus, Auto Union and Adler. The E 50 was essentially a Panther streamlined for production. It might have used the Schmalturm and 8,8 cm PaK 43 L/71. E 75: Heavy tank weighing between 75-100 tons. A Tiger II streamlined for production, in all technical respects, the E 75 would have been identical to the King Tiger. Briefly before the War ended, a Sturmgeschutz E 75 was proposed, but did not have the chance to be developed further. E 100: Superheavy tank weighing over 100 tons. The E-100 was to replace the Panzer VIII Maus. A Sturmgeschutz E-100 was proposed, either to mount a 15cm, or 17cm gun, although the latter version was preferred. A nearly complete E-100 hull was built before the War’s end; It was scrapped by the British. Germany also pioneered the missile concept, showing advances unlike any other nation, and was more than 20 years ahead compared to the rest of the world. Many new innovative weapons systems being tested at the end of the War. The whole range of missiles started with the new generation of shaped-charge projectiles, like the 8,8cm Raketenwerfer 43. There was a whole range of vehicles, mostly Panzer 38(t)/Panzer 38(d) derived, which could have carried and deployed these armaments in operations. The PAW 600 and PAW 1000 could have launched high precision self-propelled winged rounds. There were also a whole range of ATGMs in development, like the Pfeifenkopf (radio-guided missile), the Steinbock (infrared-guided), and probably the most promising and advanced of these, the X7 Rotkäppchen (Red Riding Hood), which was a small wire-guided missile with a warhead powerful enough to defeat 200 mm (7.87 in) of armour. Along with new tanks, new self-propelled anti-aircraft guns (SPAAGs) were in development. The Flakpanzer IV Kugelblitz (Ball Lightning) was a Panzer IV chassis armed with a round turret housing dual MK 103/38 3cm autocannons. The most impressive of the new Flakpanzers, however, would have been the Flakpanzer V Coelian, which came in three flavors, one with quad MG 151 2cm cannons, one with dual 3,7cm FlaK 43 cannons, and one with a single 5,5cm Gerät 58. A VK30.02(DB) how it may have appeared in service in Northern Italy, 1945. Daimler Benz’s submission for the VK30 project, which would eventually become the Panther. There were four companies that entered the competition to design a new, heavy medium tank to match the new Soviet T-34, Henschel, Porsche, MAN, and Daimler Benz. Henschel’s design was already outdated, resembling an oversized Panzer IV, having a short 7.5 cm (2.95 in) KwK 37 L/24. Porsche’s design, the Typ 100 Leopard (not to be confused with the VK16.02), was designed in tandem with the VK45.01 Tiger (P), but was dropped as the Tiger program took off. MAN and Daimler’s VK30.01s were the true contenders, and both were ordered to make a second, improved model. MAN’s design won the competition, and was hurried into production as the Panther Ausf.D; even though Albert Speer preferred Daimler’s design. The Daimler Benz VK30.02 was a nimble and fast medium tank project at 35 tons, with roughly the same weight size and mobility as the T-34, but with a far better gun and optics. The first design version incorporated well-tested and less labor-intensive solutions, like leaf spring suspensions combined with doubled small roadwheels and return rollers. It was to be propelled by a Daimler Benz diesel engine, with the drive sprockets at the rear. The Daimler VK30.02 could have been substantially cheaper to produce as well, perhaps enough to see 8-9,000 in service instead of the 6300 Panthers eventually produced by MAN’s factory. The MAN design, however, had a roomier turret, and more modern suspension, with larger tracks and fared better on soft ground. In addition, it was propelled by the same engine as the Tiger, with standardization helping both to ease production and maintenance. In March 1942, after intensive trials, the Daimler-Benz design was rejected and the MAN project was chosen instead. A Panther II how it may have appeared in service in 1945, with steel-rimmed wheels and standard turret. The Schmalturm could have been adopted at some point as well. The Panther II emerged from Hitler’s insistence for an up-armored Panther, as well as from the need to increase commonality with the Tiger II, then in development. In April 1943, the planned Panther II would have received, on paper, a 100 mm (3.94 in) thick glacis, with 60 mm (2.36 in) of side armor and production was scheduled in September 1943. The same 75 mm (2.95 in) L/70 KwK 42 gun was used and a prototype was ordered in August 1943, propelled by a Maybach HL 234 900 hp (671.4 hp) engine, coupled with the GT 101 gas turbine. By the summer of 1943, it was chosen to upgrade the Panther instead, and eventually was merged with the E 50 project. US forces eventually stumbled upon the prototype fitted with an Ausf.G turret in 1945, now displayed at Fort Knox. The Ausf.F was smaller in scope, mainly consisting of an upgraded turret with a narrow front, the “Schmalturm”. An E 50 how it may have appeared in service in 1945, with the standard IR Vampir night vision combat system. Incorporating design features of the Ill-fated Panther Ausf.F as well as the Tiger II, the E 50 was to be the new standard medium tank of the Wehrmacht, aimed at replacing the Panzer IV and Panzer V Panther. The design of the E-50 was much simplified and far less labor-intensive to build than the Panther. The E 50 shared the same hull design and dimensions as the E 75; this was to allow the same machines and tools to work on both tanks. Both the E 50 and E 75 had the transmission moved to the back, thus if the front idler wheel was destroyed in a mine blast, the tracks could be adjusted around the remaining road wheels and the tank could limp back to a repair shop. The E 50 was originally supposed to use a supercharged Maybach HL 230 engine, but as it was not ready, production was to go ahead with the Maybach HL 234. The E 50 was to use Belleville Washer coil spring suspension, with three double bogies on each side. Compared to the Panther, the E 50 had improved frontal armor, and a Schmalturm turret, housing the 8,8cm PaK 43 L/71 gun; as well as all-around improved ergonomics. Nothing ever came of the E 50 project by the time the War ended. A Löwe how it may have appeared in service in 1945. Another alpha predator for the Eastern Front, the Löwe (Lion) was intended to compliment the Tigers, being heavier, and less common. The VK70.01 project started on November 1st, 1941, when specifications were given for a tank of 70 tons, with 140 mm (5.5 in) thick frontal armor and 100 mm (3.94 in) thick side armor. A 1000hp Diamler-Benz Schnellbootsmotor from an E-boat would propel the tank up to 43.6 km/h (27.1 mph). The crew layout was standard for German tanks; Driver and Radio Operator in the hull, Gunner, Loader, and Commander in the turret. Krupp, which had lost out on the Panther program, was ordered on December 17th, 1941 to develop this new tank, not exceeding 90 tons. On January 21st, 1942, Krupp revealed their design, armed with a 10,5cm KwK L/70 cannon. At this point, the engine was changed to Maybach’s new 800hp HL 230. In February 1942 Wa.Pruef.6 ordered two tanks (one with a turret, one with a test weight) of 72 tons to be built and for series production to begin as soon as possible. These tanks were to be 72 tons as the railcars used for the Tiger could carry this amount of weight. They would share the Tiger’s drive train and armor layout as well (100mm at the front, 80mm at the sides). In April 1942 the VK70.01 name was dropped and the tank was simple called “Panzerkampfwagen Löwe”. Due to increased demands for armor and weight, the contract was redacted on May 18th, 1942, and Krupp was forced to stop work on the turret on July 20th. Many different designs were proposed and drawn up during the Löwe’s short life; some had the turret in the front, some had the turret in the middle, and some placed the turret at the rear. Some designs were given a 15cm gun, while most used a 10,5cm. There remain specifications of six designs, however their blueprints, and possibly the existence of dozens of more designs, have been lost to history. Note: No design was ever called “Schwerer” or “Leichte”, these are fictional designations. An E 100 how it may have appeared if rushed into production with the original Maus turret and 15cm cannon, in service in Eastern Prussia, early 1946. Originally conceived in 1942 as a competitor to Porsche’s Maus, Henschel’s Tiger-Maus incorporated Tiger II components in order to speed up development and production. In the end, this did not happen, and Porsche’s design continued unchanged. However the design was resurrected for the Entwicklung project, as the heaviest of the standardpanzers. The suspension was changed slightly (12 interleaved double roadwheels per side (48 in all), and external Bellville-Washer coil spring suspension), and the name was now E 100. The turret for the Tiger-Maus, and E 100 during the earlier part of its life was very similar to that found on the Maus; this is of course because it is the same turret, designed by Krupp: On the Maus it had to be modified. On the E 100 it would have carried a 15 cm (5.91 in) L/37 cannon, with a coaxial 7,5 cm (2.95 in) L/24, along with a commander’s cupola and machine gun/pistol ports. On May 17th, 1944 Krupp designed a new turret for the two super heavy tanks, known as the Maus II turm or E 100 turm; the new turret was lighter and resolved the possible shot trap of the original Maus turret by way of a sloped front. On the E 100 the new turret would have slightly less armor than on the Maus II. This new turret also did away with the 15cm gun in favor of the Maus’ 12,8cm (5 in) KwK 44 L/55. The E 100 would have been propelled by a 700-800hp Maybach HL 230 P30 engine, and would have weighed somewhere in the range of 130 tons. In 1943 Krupp had gotten permission to build one prototype and pawned the job off to Adler. Adler had significant difficulties securing parts and materials for the tank as the conditions of the war deteriorated. At the end of the war the chassis was nearly complete, when the British overran the factory. After briefly analyzing it, and deeming it ridiculous and obsolete, the chassis was scrapped by the British. It was suggested to make a Sturmgeschutz variant of the E 100, utilizing either a 15 cm (5.9 in) or 17 cm (7 in) gun (the 17 cm was preferred), but the war ended before anything could come of the design. A Ratte next to an E 50 medium tank and an Sd.Kfz.250. 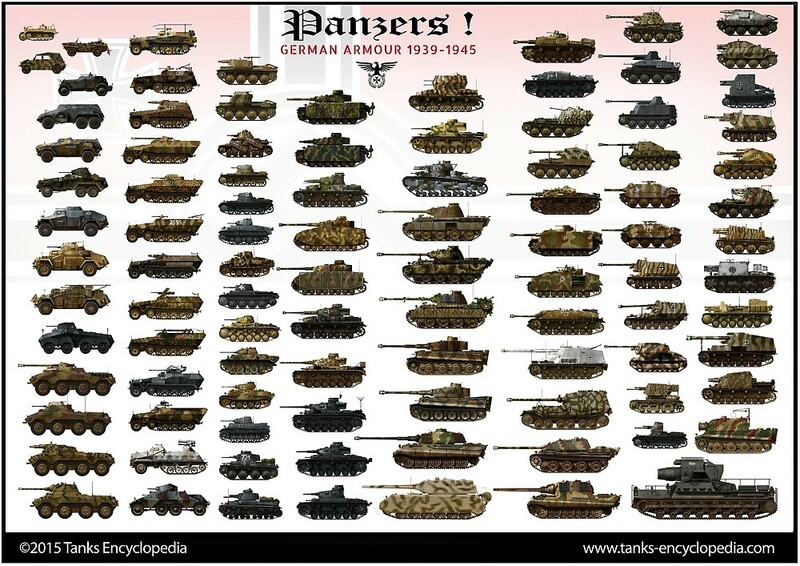 Dwarfing all other armored vehicles on this page, or indeed this website, was the Landkreuzer P.1000 – The Rat. This was to be the first of a new kind of “land battleships” (or “land ironclads”, as described by H.G. Wells a century before); a mobile fortress capable of leading an entire Panzerdivision, while covering the offensive with long range, powerful battleships guns, providing anti-aircraft defense, and acting as a mobile HQ. The Ratte was designed by Krupp’s chief-engineer and officer of submarines, Edward Grotte. Edward, however, was not new to the idea of landships; before the war he had assisted the USSR in tank development, proposing many ridiculous monsters, similar to the rat. His only design that ever was built was a much more modest 25 tons. Grotte suggested the design to Hitler, who immediately approved the plan in June 1942, naming it “landcruiser”. This would have been a 1000ton, ultra heavy tank, equipped with dual 280mm (11 in) SK C/28 naval guns in a Panzerschiff mount, derived from the Detschland-class cruisers. Several designs were proposed and mockups made; the design in our illustration is the most common design for the Ratte. Secondary armament would consist of between two 12,8 cm (5 in) KwK 44 L/55s, or four to eight 12,7cm (5 in) SK C/34 naval guns, depending on model. After several design changes, anti-air defense was settled on two Flakpanzer IV Wirbelwind-type turrets, each with quad 2cm (0.79 in) FlaK 38 autocannons. 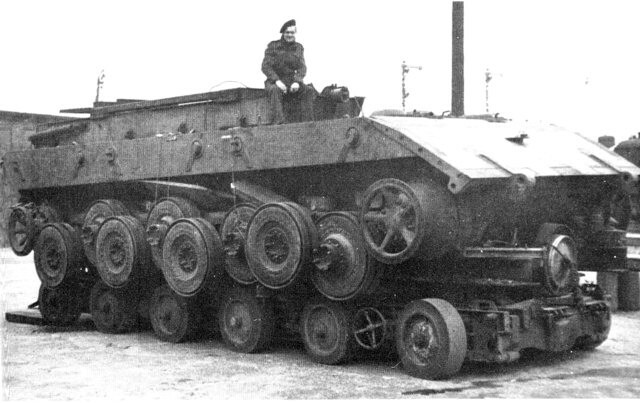 The tank was so heavy that a unique six track system (two pairs of three) was conceived. Armor was impregnable even to aircraft bombs, with up to 36 cm (1 ft 2 in) of hardened steel plates. No bridge could hope to support such weight, but it could easily cross rivers due to its towering height. The wide hull contained a small bay for BMW motorcycles, several storage rooms, a compact infirmary area and a self-contained lavatory system. Propulsion was assumed by either two 8,400hp MAN V12Z32/44 24-cylinder U-boat engines, or eight 2,000hp Daimler-Benz MB 501 20-cylinder E-boat engines. U-boat snorkels were also fitted for amphibious fording of deep rivers. Shortly after the project was approved, Albert Speer cancelled it, as well as a self-propelled gun of 1500 tons, the P.1500 “Monster”, armed with the 800 mm (2 ft 7.5 in) Gustav gun, thus ending Hitler’s fantasy of an Empire-like fleet of war machines. Mind if you direct us to a source? If I’m not mistaken, the VK 72.01 (k) is one of these designs. Um, I read in Wikipedia that there were both vehicles. The light one had the turret in the rear, and weighed 72 metric tons(83.8 short tons). Hitler ordered work on the Light Lion stopped to concentrate work on the Heavy one. YES A PROTOTYPE TANK PAGE! YES! AWESOME! I know right. What would be even more awesome is if the tank was put into action and allied tanks and planes actually had to defeat the Ratte. I would kill to see that on some black and white war film. When I was a kid I drew tanks as P.1000 Ratte , no serious person can not be considered tenk. And he would not functioned for 100 years even in dreams .This is not project this is fantasy like Harry Potter…. The main turret has wrong specifications, its 3X 280mm c-turret from Gneisenau, it was suposed to be used to Ratte, but they ended up sending it to Austråt fort as a costal cannon. That’s correct. They removed the central gun to increase ammo storage and the turret guns’ rate of fire. I recently read in a book by Osprey publishing, i think another book is well, that no plans for the P1000 “Ratte”, or P1500 “Monster” were never actually found, but documents relating to multiple concepts were found by US intelligence, and misinterpreted. Yes!! I’ve only seen the Bar in some fellow’s computer show of German prototypes! What is it? UPDATE: I’ve found the Sturmpanzer Bar. Took a little digging, though. The Germans wanted to mount—get this—a 305mm howitzer on a Tiger II chassis. No traverse, just elevation, but even with thinner armor it weighed a calculated 120 tons!! And another bit of wackiness: it was an antitank vehicle. Yep, rival design for the Sturmtiger. At its size the P. 1000 would probably have taken 15 months to build, if not less. So much for mass production. I love German Tanks and these are the things i study. Are these true facts of these prototypes? The Lowe is my favorite and most conventional of this otherwise revolting armored freak show. It’s the only one of these monsters that I truly like The Germans should have concentrated on it, not the Maus, but Adolf LOVED bigger tanks, believed essentially that the Lion, at 99.25 tons, was—get this—TOO SMALL!!!!!! Do you need a better illustration of egomania at work? I hope I’m not the only one laughing at this! Germany and their massive tanks XD. Though i think the panther II, e-25, and e-50 would have been pretty cost effective tanks. The “Mauerbrecher” is based on technical drawing K 3384, an early concept for the Maus. I recommend Schiffer Publishings, “Kampfpanzer Maus, The Porsche Type 205 Super-Heavy Tank” book by Micheal Frölich. Its a bible for the Maus and features this drawing. Another fine addition to this list would be the design proposals of the Panzer IV/III and Panzer V/IV medium tanks; the Panzer IV/III was intended to increase part commonality between both tanks, while the Panzer V/IV intended to replace the boxed frontal armor of the Panzer IV with sloped armor. The Panther II prototype that used to be in the Patton Museum at Fort Knox, KY, was moved to Fort Benning, GA, in 2010. Not currently on display. I would imagine that a large part of the p1000 ‘s concept would be mostly intimidation. I mean just imagine looking up and seeing this monster (not the tank p1500 which would equally scary) coming towards you, But that would be hard to be a surprise as I think the word of it would spread quickly. Hello Xander, that’s a personal opinion, but intimidation would only work on paper as mobility in itself would have been a nightmare, the simple prospects to move it a few miles on the right ground would have been a feat in itself, therefore being at the right spot, the right time and meet the enemy would have been a remote prospect. Probably allied aviation would have spotted it before, so that it could be dealt with by heavy artillery or a carpet bombing long before meeting any ground unit. From what I understand on the web, the “Tiger Maus” and E100 are two different designs. The E100 stems from the Tiger Maus, but they are not the same. I have been searching for additional information on the Tiger Maus version of the E100, but although it is referenced frequently, nobody seems to have much info. If Tank Encyclopedia could look into this, that would be great. I’ve heard of plans for a p2000 gott. Was every conceived? No. Only P1000 and P1500 were real.